Observation - Black foliose lichen - UK and Ireland. Description: Black foliose lichen patches, looks as if remaining from large rosettes, growing on vertical limestone face. Lobes thin and ragged in places. Some isidia on lobes - visible in right hand picture (close up of part of lower patches in left hand picture). 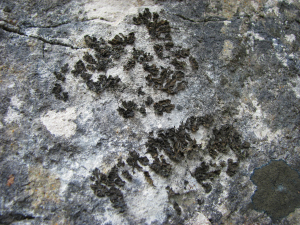 Black foliose lichen patches, looks as if remaining from large rosettes, growing on vertical limestone face. Lobes thin and ragged in places. Some isidia on lobes - visible in right hand picture (close up of part of lower patches in left hand picture). Possibly Collema cristatum.